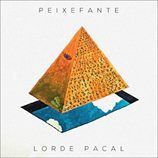 Brazilian band Peixefante have released their debut EP ‘Lorde Pacal’. With a mixture of guitars and synths, they capture a pyschedelic rock sound that combine dark and brooding vocals with a more dreamy soundscape. Their 7 track EP devotes itself to a strong sound with an eclectic mix of styles, sometimes quite soft in sound, as well as more upbeat tracks. Although the tracks do contain vocals, they also bring in an instrumental element, especially towards the end of some of the songs, and this leads to a lush pyschedelic tone to the record. Peixefante is a mixture. The name itself, the portuguese combination of Fish and Elephant, exemplifies the constant mutation in which the band’s music in based upon. From the deep giant synth waves psychedelia to a drunk swampy rock, all members manage to print their marks and influences to the overall feeling. The band was put together in early 2015 due to the similar musical interests shared by the four friends, and their closeness soon started to grow into which would later become their first EP, entitled ‘Lorde Pacal’. The EP is available to stream from their soundcloud page or via YouTube.